In New York City, every day feels different. Each neighborhood has its own unique personality, with an energy that vibrates differently depending on the time of day, the week, or the year. 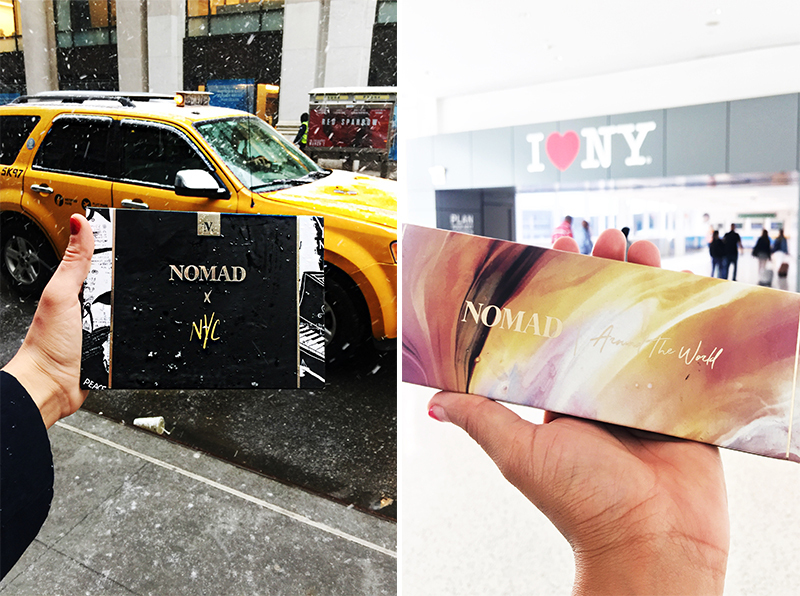 Our founder Stephanie Flor is a New York born-and-bred local, and regardless of where she travels she always finds her way back home to the “greatest city in the world.” Steph created a special New York itinerary inspired by Nomad Cosmetics’ New York City Palette. The palette features cold grays and deep blues that are illuminated by glowing whites and soft pinks, reflecting the highs and lows of this dynamic city. It’s an all-in-one palette (including a primer!) that gives you everything need to create an edgy-urban beauty look that can evolve from day to night, whether you’re walking in Central Park during Cherry Blossom season or dancing the night away in Meatpacking District. Let’s go on an adventure with Stephanie while she uses the versatile New York City Palette and visits her favorite insider spots in the city that never sleeps! When you visit the East Village, you can almost feel its vibrancy coming to life. The stomping grounds of Lady Gaga and Madonna, where art, skateboarders, and fashion meet, the East Village is home to secret streets and hidden history. You might pass where the Wolfgang Brothers were locked up for fourteen years, or where music history was made. The Lower East Sides hides its own second city of underground bars open past the usual 2 AM closing time, where you can find any nighttime vibe to suit your tastes. Over the years, commercialization has drastically changed this neighborhood, but locals continue to fight to keep it as raw and authentic as possible. Take a cue from the eye-popping street art and sweep the shade “Graffiti” across your lids. This velvety, shimmering pink was inspired by the vibrant pops of color found in subway art. Once viewed as a public nuisance, graffiti has moved into the spotlight in the city’s studios and galleries. And with a pop of pink on your eyes, you will certainly stand out among the artists and innovators of this community. Stephanie’s favorite spot by far to view the New York skyline is 230 Fifth; a rooftop bar and restaurant that is open to the public. You don’t have to worry about sneering bouncers or an over-the-top dress code, because this spot is friendly to tourists and locals alike. It’s the perfect place to capture the Empire State Building in all its glory; especially during a summer sunset. In the winter, they even have cozy red coats and heated igloos to keep you warm and add to the fun of being outside on the top of the world. If you’re visiting 230 Fifth during the prime summer season, be sure to sweep a mix of the palette’s blush and bronzer, Vanguard and JZ Line, on your cheekbones for a flushed and healthy summer glow. Steph’s Insider Tip: Grab a table and spend $250 for the VIP experience. You can buy drinks and food, and get a table for less than $300.00 — a steal for New York. It’s one of the most magical ways to take in the changing seasons and to celebrate special occasions. The Manhattan/Queens subway line (also known as the Jamaica line) connects the boroughs to the main hub of Manhattan. When you enter the subway, you enter a melting pot of all nationalities and race (and during the summer, it really is a melting pot). If you’re lucky, you’ll experience a dance performance or maybe catch a rap battle, Mexican guitar, or opera performance. Make sure to carry some extra change to tip these hardworking musicians who bring their talent to the rushing masses every day. Make sure to wear comfortable shoes and explore Queens and Brooklyn, and see the real New York way of life. New York is full of beautiful, unique women who are different from the ladies of any other city. There’s an edge to them. And they’re filled with big dreams that are fueled but a drive that burns straight from their hearts. These women create monumental to-do lists. They make them happen every day, all while holding their own in the concrete jungle. There’s a reason why Nomad Cosmetics included an eye primer in the palette to hold eye-shadow in place all day without creasing. 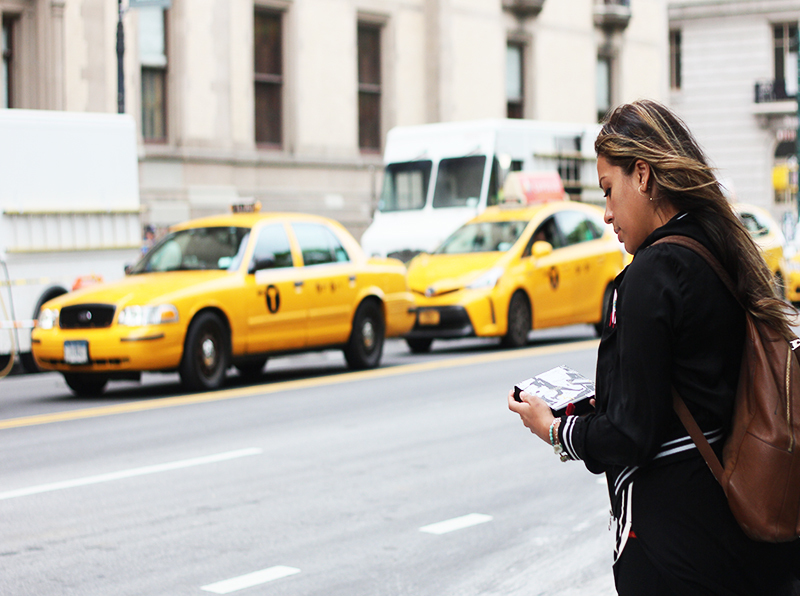 When you’re hustling as hard as New York ladies, you need your makeup to last long and not quit. Steph’s Insider Tip: If you’ve spent the whole day working and are ready to unwind, head downtown to Meat-Packing district where you can dance the night away, and mingle with the fabulous faces at The Jane Hotel or the famous Boom Boom Room. The art scene in New York is endless. There are so many great museums and galleries to see it could take a lifetime to see them all. Visit the MET for the classic New York art experience, or if you’re into modern art, check out MoMa. If you’re travelling with children, check out the dinosaurs and animals at the Museum of Natural History. Always check for whether the tickets are a suggested donation — if you’re travelling on a budget, this means you only have to pay what you can afford to donate. When visiting the art galleries and museums, create a masterpiece of your own by using the palette’s black kohl eyeliner and “NY Blue” eyeshadow to make a bold blue smokey eye. 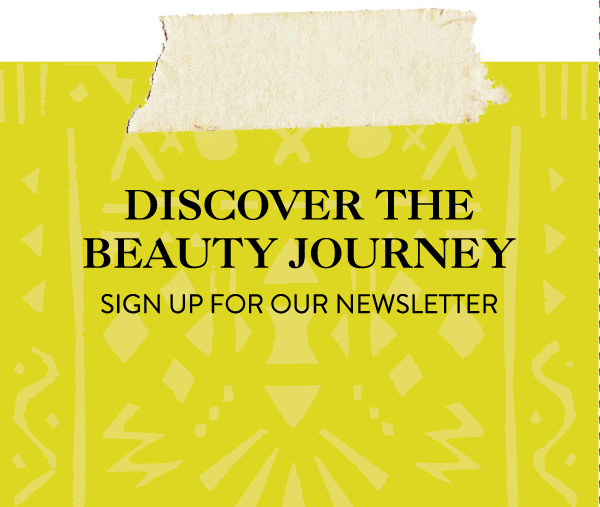 Check out our NYC beauty video using Nomad Cosmetics! Need a break from a busy day of museum-hopping? 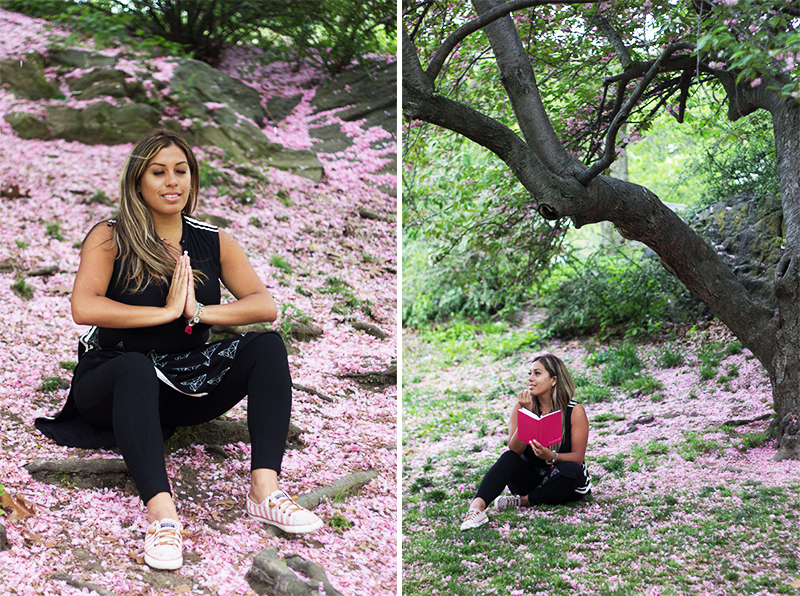 Check out Central Park — it’s beautiful any time of year, and walking there is one of Steph’s favorite pastimes. It’s a beautiful place to relax in between activities, or even do a quick makeup touch-up. Depending on the time of year, you might catch the fall leaves changing, a magical winter snow, or the full green flush of summer. If you’re lucky enough to be in New York during Cherry Blossom season, make a beeline for Central Park and soak in the magical pink blooms. It one of the most beautiful things to do in the city and keep you grounded. Whether you’re driving in or taking the train, there’s something about seeing the iconic landscape of New York that reminds you this is a place where dreams come true regardless of who you are. If you’re ready to work hard and think big, this city was made for you. We hope you enjoyed this post, and are inspired to find beauty in the hidden corners of this crazy city. 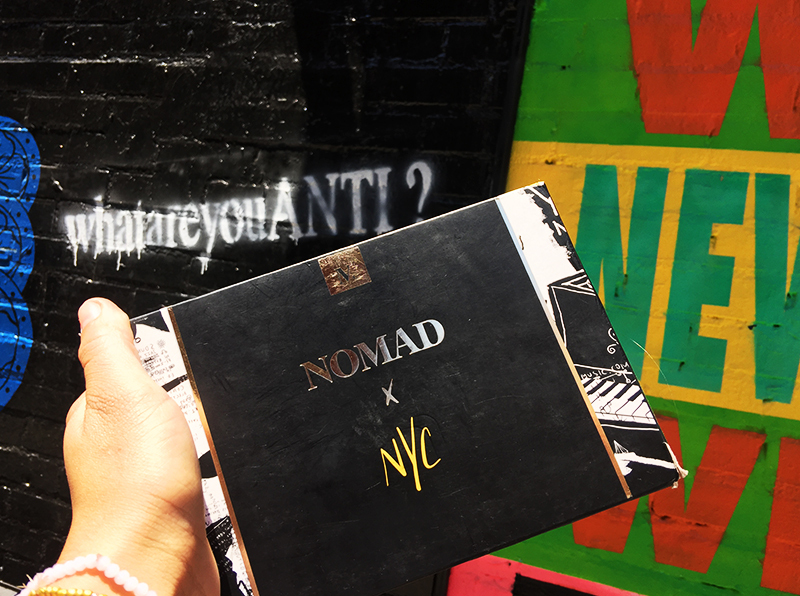 Special thanks to Nomad Cosmetics for allowing us to explore their inspiration behind their NYC Palette. Explore the city one subway at a time! Be willing to get lost! Central Park is my little escape. In-between work I will meditate and journal. 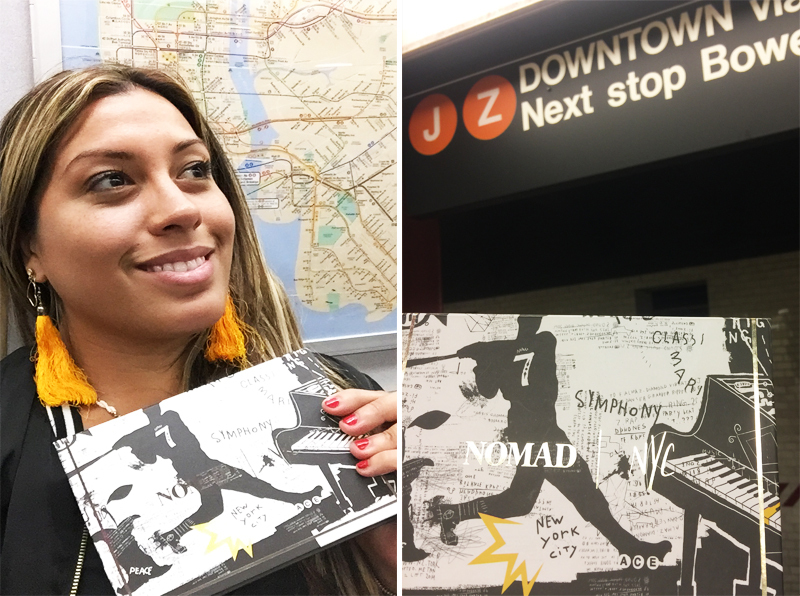 Nomad Beauty travels with us Around The World!